GetDivorcePapers.com provides professionally completed, 100% court-approval, money-back guaranteed Louisiana divorce forms. Just create an account, complete the interview, and file for divorce. 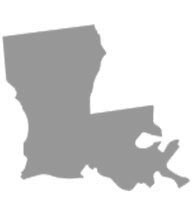 Our case managers do all the work for you, and send the completed Louisiana divorce forms when they are ready to be filed. It is essential for the filer spouse to be the resident of Louisiana for twelve months before presenting the case in courts. Further, this case must be in writing, bearing the signatures of filer, and submitted into the parish of either of two spouses. Louisiana deals with no-fault reasons and general reasons in divorce cases. Among no-fault reason, it is not necessary for the couple to live separate for any specific time before filing the case. Neither do they require having any domestic violence. All that they need to have is the separation for 180 days after the divorce case has been filed in the court. As far as general reasons are concerned, following are the major causes for the divorces. Two or more years' separation of the spouses before the filing of the case. Conviction of the crime and jail. Living apart from more than 12 months after legal separation. To either of the parent. To the family member or person that the child is already living with. To any other individual that the court feels as the most suitable guardian after all above mentioned options. Basic needs of the child including his or her social needs. Ability in the parents to fulfill the needs of child. Decision of the child if he or she is capable enough. Association between the child and parents. Health conditions of everybody involved from the family. If a parent is not granted with the custody of the child based on the above mentioned factors, then he or she is allowed to visit the child. However, if the reason of divorce is based upon child abuse, then this right is also taken from such parent. Financial strength of both spouses. Value of property of each parent. One of the deserving spouses may get the alimony granted by the court that has to be paid by the other spouse. This amount does not exceed the one third of income of the payer. Followings are important points in this regard. Education and skills required to the dependent spouse. Debt obligations of the both spouses. Time period that the marriage lasted for. Tax liabilities on both the parties. Age and fitness of spouse. This state provides the guardian of the child with some amount to cater the needs of child. Amount of this support is estimated after considering following points. Requirements of the child and capability in parents. Medical expenses of the child. Disability in parent who is looking after the child. Financial standings of the parents. Courts have the rights to suggest the parents for mediation. There is no need of a lawyer when applying for divorce in the state of Louisiana. A divorce case which is filed without any help of an attorney in any of the states is known as Pro Se Divorce. Literally, Pro Se is a Latin phrase and it means "on her or his own". Process of getting the divorce without the help of lawyer may vary from one State to another. These types of divorces are perfectly legal and enforceable in Louisiana, and are actually very convenient. Usually, once settlements have been made regarding property distribution and custody matters among the spouses in case of a mutual divorce, Pro Se Divorces are filed.